Not long ago, we finished a series on How to Get Started With WordPress and then began this short, two-part series as a follow-up. In the previous article, we took an in-depth look at what WordPress themes are, how to think about them, and where to find them. But WordPress themes are only half of the market when it comes to searching for solutions to using the application. As we defined in the previous post, WordPress themes are for presentation. This raises the question: What offers functionality? That's where WordPress plugins come into play. If you're new to WordPress and have read the previous article and the series prior to that, then you're in a good position to proceed with this article, in which we'll take a deeper look at WordPress plugins. Note that this article isn't aimed at experienced developers. Instead, we're looking to clarify another aspect of WordPress for those who are just getting started. With that said, let's proceed. As we start our discussion on WordPress plugins, it's worth noting there is a fundamental difference between themes and plugins: Themes are for presentation, and plugins are for functionality. This doesn't mean that plugins can't offer some type of user interface for a front-end element (or elements), but it does mean that a theme shouldn't include a lot of functionality, and there shouldn't be a bulk of, say, templates in a plugin. But that's my take. What does the WordPress Codex have to say about the matter? In my opinion that's a good, clear definition. And it's also a great way to kick off the Codex article that provides you with information on how to start writing your own plugin, so I recommend reading the entire article. But there's a lot more to WordPress plugins than writing them (and that's beyond the scope of this article, anyway). For example, what should we be expected to pay for a plugin, where can we find plugins, and so on. How Much Should We Pay for Plugins? Unfortunately, there's not a clear answer to this. Because plugins come in many different types, there's a wide variety of what you can expect to pay. Some plugins can go for $5 or $9, and some can be several hundred dollars, depending on what they do and who they are attempting to reach. Some plugins are free, and some are not. Those that aren't free are considered to be premium plugins. Premium plugins may offer a one-time purchase or may require a subscription on a per-month basis, per-year basis, or a per-site basis. There are many, many free plugins that are available for WordPress. The best and arguably safest place to find these plugins is in the WordPress Plugin Repository. They are searchable from within the WordPress dashboard itself or from the Plugin Repository website. The plugins that you find in the repository will likely offer just about anything you can imagine; however, they may not all be up to date with the current version of WordPress, so it's imperative that you read up on the plugin before installing it. Furthermore, some of these plugins may not offer support. This means that if you have a problem with the plugin, then you may not be able to get any help with it beyond what's offered in the support forums. Conversely, some people do provide support for their free plugins. Where they do this varies. Sometimes it's via email, sometimes it's via the built-in support forum in the WordPress Plugin Repository, and sometimes it's through another help-desk solution. Just as is true when installing WordPress plugins, you will need to read the information on the plugin's homepage before installing it to find out as you can about the plugin, its functionality, and where to get support for it once you've begun using it. Because WordPress is licensed under what's known as the GPL, its derivative works also inherit that license. This means that any of the software that's built on top of WordPress or that extends the software is also freely available. Then again, this is more of a legal issue than a software issue and is beyond the scope of this article. But this raises a question: How do you purchase WordPress plugins when the source code can be made available for free? Some sell support for their WordPress plugins. Some sell licenses and support for a number of different sites. Some sell additional features for their plugins. Some sell add-ons for the core product. The point of this is not to diverge into talking about ways to monetize plugins but to share that there are different ways in which individuals and companies will sell their work and to show you what you can expect. Where Can We Purchase Plugins? As is the case with pricing, there's not just a handful of places where you can buy plugins. 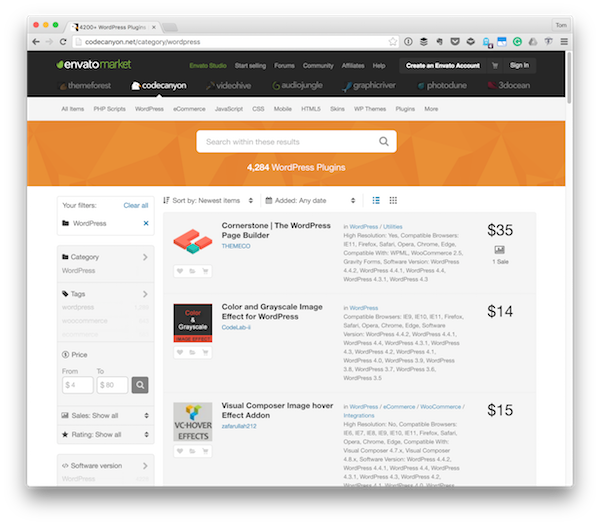 Sure, there are marketplaces like CodeCanyon, the WordPress Plugin Repository, and many more. When it comes to purchasing plugins, it's more important to know who you're buying from and what you're buying. Unfortunately, as with many industries, there are some people who attempt to create products for the sake of scamming other people rather than providing a product with any real value. To that end, it's more important to understand things to look for (or look out for) rather than only sticking with a couple of marketplaces. Say, for example, you find a plugin that appears to do whatever it is you need for your site but you've been unable to test drive it, you can't seem to find anything else about the vendor online, and the purchase page isn't properly secured using SSL. This is likely not going to be a place where you'd want to purchase a plugin. On the flip side, if you've been using a free plugin and it offers a premium version or you find a plugin that appears to suit what you need, and it's by someone who gives back to the WordPress community, is easily found online, has a proper store, and has somewhat of a reputation that precedes them, then you're likely safe buying from them. Of course, neither of these are hard and fast rules. Above all else, it's always acceptable to ask others if they've heard about a given product and whether or not they've used it (and what their experience has been). Even in the case where a person appears to be reputable at selling products, they may do a poor job at managing their customers, offering support, or keeping their products updated. Whatever you opt to do, proceed with caution and attempt to pursue the purchase in the wisest way possible. How Do I Build Plugins? Building WordPress plugins can be a lot of fun regardless of whether you're looking to get started in programming or you're already a developer who's looking to extend the application. At the most fundamental level, this shows interest in contributing to the WordPress economy and solving problems for a variety of those who use the application for their websites, their blogs, or their web applications. On top of that, it's also common to see developers using preprocessed languages such as Sass and using libraries such as jQuery. Building a WordPress plugin can be a daunting task depending on your level of experience and/or the complexity of the problem that you're trying to solve. For example, if you're brand new to writing WordPress plugins, then writing something that's somewhat simple will still be daunting because of the learning curve that comes with building a plugin. Conversely, if you're more experienced, then the challenge comes in having your work interface with third-party services, following proper conventions, and/or writing them in a maintainable way following the WordPress Coding Standards and so on. Of course, there are many more articles and videos about this. Nonetheless, those listed provide a great starting point. As we've mentioned, WordPress themes are ideally meant for presentation, and WordPress plugins are meant for functionality. It's not uncommon to find themes including functionality in their codebase. But if you're looking to get started with WordPress development in a professional capacity, I highly recommend keeping the concerns of each separate. This will go a long way in making sure that you not only reach a target audience, but also have yourself set up to more easily maintain your projects. And for those of you who are interested in learning to write WordPress plugins, there's a lot of documentation and open-source code from which you can learn. Furthermore, we have several courses specifically on this topic. On top of that, we also have plenty of plugins in the marketplace that are available for you to download, to study, and to use in your day-to-day work. For those who continue to be interested in WordPress, note that I exclusively work with WordPress and often write about it. You can catch all of my courses and tutorials on my profile page, and you can follow me on my blog and/or Twitter at @tommcfarlin where I talk about software development in the context of WordPress.